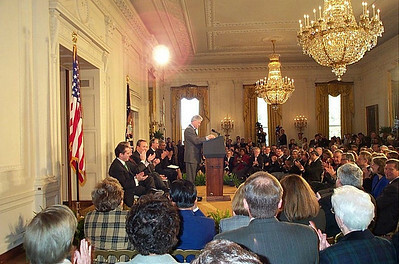 President Clinton addresses debt relief supporters at a ceremony in the East Room of the White House Nov. 6. Supporters included a large group of religious leaders, representatives of non-governmental organizations and labor unions, advocates for Africa and members of Congress. President Clinton met with supporters of the debt relief legislation in the East Room of the White House Nov. 6. Among them was the Rev. Mark B. Brown, right, assistant director for international affairs and human rights, Lutheran Office for Governmental Affairs (LOGA). LOGA, Washington, D.C., is the ELCA's federal public policy office. On behalf of the ELCA, LOGA was among the many groups working with Congress on debt relief legislation. 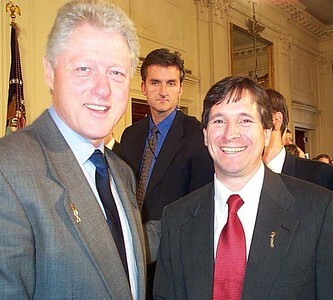 Clinton and Brown are wearing "Jubilee 2000" lapel pins.